All Ford Motor Company vehicles welcomed. 1903 to 2018. Plenty to see and do during Highland Fest – Art & Music in the Village. Dash plaques to the first 100 vehicles. Free swap out of your trunk. Bring parts to sell. 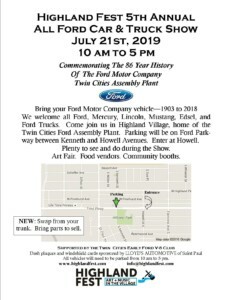 Also, special Twin Cities Ford Assembly Plant history lecture at the Highland Library. An official Highland Fest event.